We’re at midcourt, and the ball is about to go up…it’s Monday Tip-Off! Start your week here at the NLSC with a feature that’s dedicated to opinions, commentary, and other fun stuff related to NBA Live, NBA 2K, and other basketball video games. This week, I’m tipping things off with a look at the plots and characters that keep appearing in MyCAREER stories. Writing about Jackson Ellis for Wayback Wednesday got me thinking about recurring characters and call backs in MyCAREER stories. While I’d like to see MyCAREER move away from the story-driven approach, or at least evolve into a fresher, more dynamic experience, I do find that I can still have fun with the concept. Whether it’s suggesting new scenarios or coming up with a handful of off-the-wall theories and alternative interpretations, the subject doesn’t have to be something I only grumble about over and over again. Some of the MyCAREER stories have definitely turned out better than others, both in terms of their narrative and the way in which they affected the gameplay experience. From a gameplay perspective, each story is self-contained. Nothing that we do with our individual MyPLAYERs will carry over to the next game, at which point league history – all stats, awards, and championships – reverts back to reality. However, there are references to previous stories, recurring characters, and even a few subplots with NPCs. Just for fun, let’s try to piece together some kind of canon for MyCAREER’s stories. We’ll call it the MyCAREER Cinematic Universe. Let’s begin with Jackson Ellis, as he basically holds the universe together. His most prominent role was in NBA 2K14 as your rival and the primary antagonist of the story, but he’s also had a presence in NBA 2K15, NBA 2K16, NBA 2K17, and NBA 2K19. The canon that has been established is that Ellis is a very talented player who made it to the league, but had to retire following his rookie season due to a serious injury. 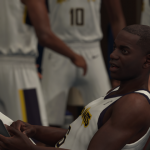 A scene from his G-League comeback in NBA 2K19 reveals that it was a knee injury, and also confirms that he did indeed spend time as a shoe rep and personality who kept close ties with the NBA, even when it looked like he’d never play again. Ellis is a constant through the MyCAREER stories, but he is noticeably absent in NBA 2K18. However, it’s worth questioning whether anything that actually happens in NBA 2K18 is canon. After all, it’s one of the wackiest stories so far, with its fair share of breaking the fourth wall and goofy humour. There’s also a scene where characters from previous MyCAREER stories are explicitly referred to as video game characters, whereas the stories in other games treat them as being real and in the same universe. The timeline of NBA 2K19’s Prelude would also place Ellis’ comeback during the 2018 season, an event that we don’t see play out in NBA 2K18. It’d therefore be easy to write off NBA 2K18 as being a standalone story in its own universe, but then there’s the matter of Sheldon Middleton, aka ATM. ATM appears in The Prelude of NBA 2K19, which does fit in with the loose canon of previous MyCAREER stories. He’s even said to have played his way into the G-League by competing in streetball tournaments, which we saw him do in the beginning of NBA 2K18’s story. We can therefore assume that ATM is a canonical character, but the rest of the tale – DJ, and all the people he meets – are not. This also means that B Fresh gets erased from existence, and honestly, I’m quite OK with that. What about the other MyPLAYER characters? Have they similarly blinked out of existence with a finger snap of this universe’s Infinity Gauntlet? Not necessarily. 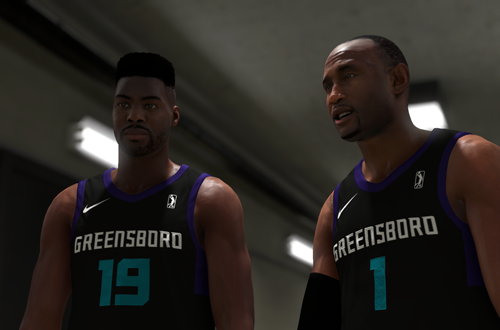 The MyCAREER stories have placed several fictional players into the NBA, including Justice Young and Denver Levins in NBA 2K17, and Paul Tatum, Corey Harris, and Marcus Young in NBA 2K19. A magazine cover in NBA 2K17 refers to Freq coming into his own during what would be his sophomore season. We can therefore assume that Frequency Vibrations, The President of Basketball, and our characters from NBA 2K14 and NBA 2K15, are all in the league somewhere; they’re just off-screen. As an aside, how cool would it be if previous MyPLAYER characters showed up in subsequent games? Their names and appearances could be randomised, but maybe they could appear on the team they were on in our games, perhaps even with similar ratings! It would certainly tie the canon together neatly, but for the moment, let’s just assume that they are in fact present. The exception is DJ, owing to the unlikelihood of him making it to the NBA, as well as NBA 2K18’s dubious canonical status. Indeed, from the whimsy of his success story to befriending NBA players and telling off Ronnie 2K, his tale seems to play out more like a gamer’s fan fiction. So, what is canon? Jackson Ellis was drafted in 2013, injured his knee and retired to become a shoe rep, before making a comeback in the G-League. Freq grew up in Harlem with his parents and twin sister C.C., who became his manager. 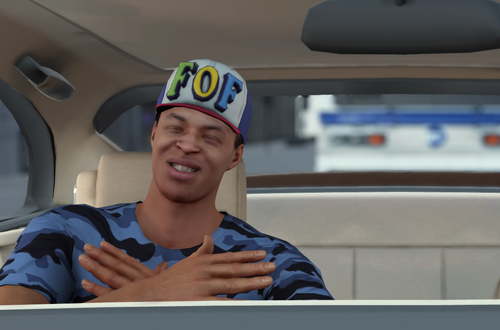 His childhood friend, the troubled Vic Van Lier, died in a car accident in 2016. Pres’ father sadly never got to see him make it to the NBA that same year, where he became one half of a dynamic duo with Justice Young, known as Orange Juice. Noted streetballer ATM competed in a tournament in 2017 that caught the eye of agents and scouts alike. He now plays with Ellis in Greensboro, where they’re known as Smoke and Mirrors. There are some other recurring characters and elements, such as the student in one of Pres’ college classes who went on to become an NBA referee. Ice has been replaced by Doc as the NBA players’ barber of choice. Alley-Oop Tattoos clearly has a few locations around the United States, as does Swag’s. The NBA has also seen fit to open a few more retail stores as well; revenue from the new TV deal must be opening up new opportunities! 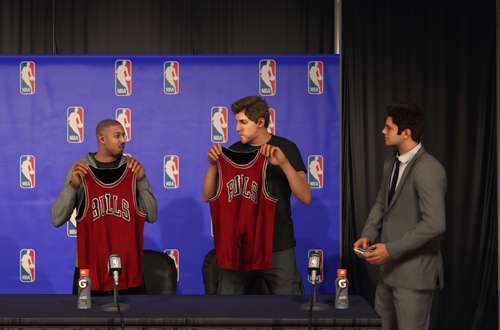 Also, since NBA 2K16 is canon, we can say that Spike Lee’s He Got Game is set in the MyCAREER Cinematic Universe, seeing as how they share a character. Jesus Shuttleworth likely retired before Freq was drafted in 2015, though. The rest of the details are up to us, and as mentioned above, are reset in every game. Pretty much everything else can carry over though, and we’ve had some fleshed out subplots along the way. They’ve varied in quality, but then again, so do most sequels and movies in a cinematic canon. Love or hate the approach, 2K has actually done an admirable job of world building in its MyCAREER stories, and even introduced some elements that can tie them all together from year to year. As much as the stories are all self-contained, they can also be put together for an overarching canon that spans the last five or six years. Honestly, it’s somewhat impressive upon reflection. Now, you may be wondering what the point of all this is. Why bother trying to piece together a canon across the stories in the career modes of a basketball video game series? Honestly, there’s no point, except as a fun writing exercise. There’s a time to be critical of the games we play – and I have several articles where I critique and offer more serious commentary – and there’s a time to just enjoy ourselves and have some fun with this stuff. Remember, these games are meant to be fun, after all. We can take them seriously, but not too seriously. Besides, we’re already putting ourselves in the NBA. It doesn’t hurt to plumb the depths of the fictional world we’re getting into.